Since the release of Mac OS X 10.6 (Snow Leopard) I've carried around a bootable USB on my keychain. It has made my life a lot easier reinstalling OS X/macOS without an Internet connection and troubleshooting Macs without a recovery partition. I also much prefer clean installs of the operating system, using this method vs updating from a previous version of OS X/macOS. This post will go through the process I use to create a bootable OS X/macOS installer. At least an 8GB USB, you can also use a FireWire or Thunderbolt drive. A Mac running 10.6.8 (Snow Leopard) or newer. A fast Internet connection to download the OS X/macOS installer. If you haven’t already you can download the 'Install macOS Mojave' application from the Mac App Store. Apple no longer provide downloads for older operating systems. 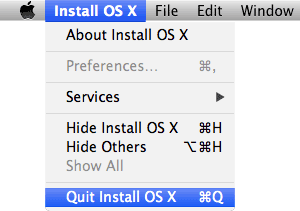 Once it's downloaded the installer automatically opens, simply quit it. We are about to erase everything on the USB, make sure you have copied off anything you wish to keep. Open Disk Utility (/Applications/Utilities/Disk Utility), select your USB drive from the list and click the ‘Erase’ tab. Click ‘Erase...’ and 'Erase' again, then enter your password if required. Open Terminal (/Applications/Utilities/Terminal) and paste the appropriate command. Hit return, type in your password, then hit return again. Don’t worry if it looks like you are not typing anything, it's just Terminal hiding your password input for added security. Depending on your USB, the copy process takes approximately 20 minutes to finish. That's it! You should now have a bootable OS X USB installer. Go test it out by plugging it into a Mac that is turned off, pressing the power button and then holding down the 'option' key. I’d like to thank tywebb13 for sharing the above Terminal command on the MacRumors forums. If you need any help feel free to leave a comment.